49. Dyson & Sons pocket watch, Hallmarked Manchester 1897 + albert chain 1919. John Dyson 1845 – 1916 was the second son of Robert Dyson, he founded John Dyson and Sons in 1865.
followed in time by numbers 25 and 26. His two eldest sons, John & Charles were to join their father. Charles was the family horologist. Charles’ sons, Harry and Kenneth, subsequently entered the business. Harry Dyson, 1899 – 1983, was an expert gemologist who insisted on retaining only the very best. Harry’s daughter Grace, born in 1928 and Kenneth’s son George, born in 1930, followed their respective fathers into the business. Miss Grace, as she was known, managed the shop until it closed. premises on Commercial Street in March 1996. The grade II listed Time Ball Buildings at Numbers 24, 25 and 26 Briggate. They date from the early nineteenth century but much of the elaborate facade was added from 1872 when John Dyson, watchmaker, became established here. Bay windows flank the large pedimented clock case at Number 25 and 26. At Number 24, left, a figure of Father Time surmounts a large framed clock on the third storey. 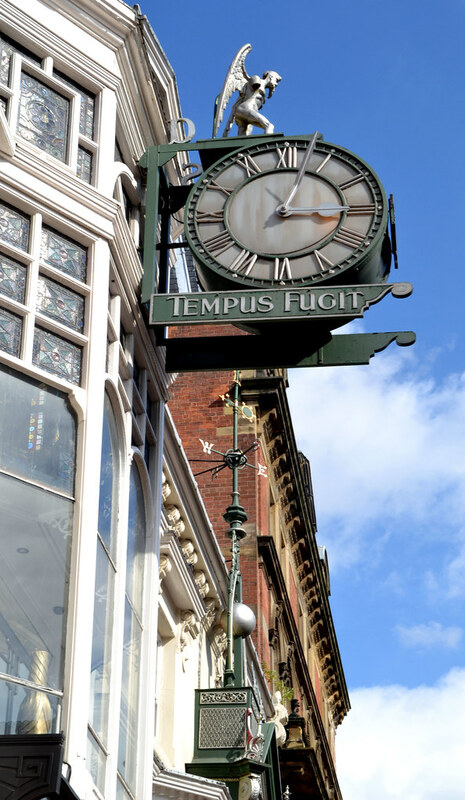 There are iron work spandrels, the letters D & S, and the words 'Tempus Fugit'. Gold lettering displays the date 1865. The gilded time ball mechanism was synchronised with Greenwich and dropped at exactly 1-00pm daily. Time Ball Buildings is an important example of the elaborate and decorative shop design employed by the Victorians and Edwardians.